Medieval Mayhem Renaissance Faire is the largest fund raising event held by the Medieval Mayhem Historical Arts Foundation, a White Mountain scholarship fund. Visitors experience walking back in history to the time of knights, vikings, pirates, kings and queens! 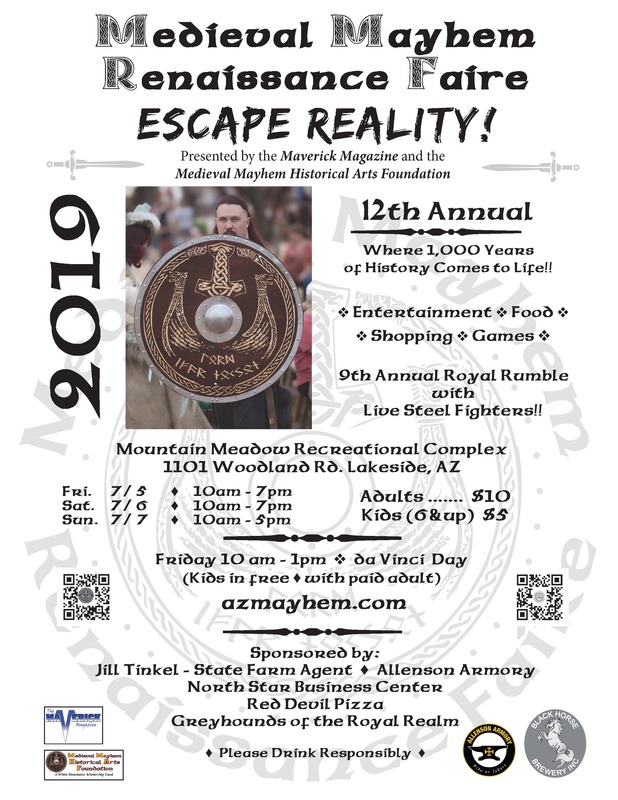 The 3 day Faire offers music, dancing, demonstrations by local artisans, armorists, sword smiths and real knights along with merchant shops, food, drink, kids games, petting zoo and the Royal Rumble - a knightly competition to the "last knight standing" and much more! Located at Mountain Meadow Recreation Complex in Lakeside, AZ. Friday and Saturday 10 a.m. to 7 p.m. Adult tickets are $10 and kids (5-14) are $5. Family passes are also available at the gate.